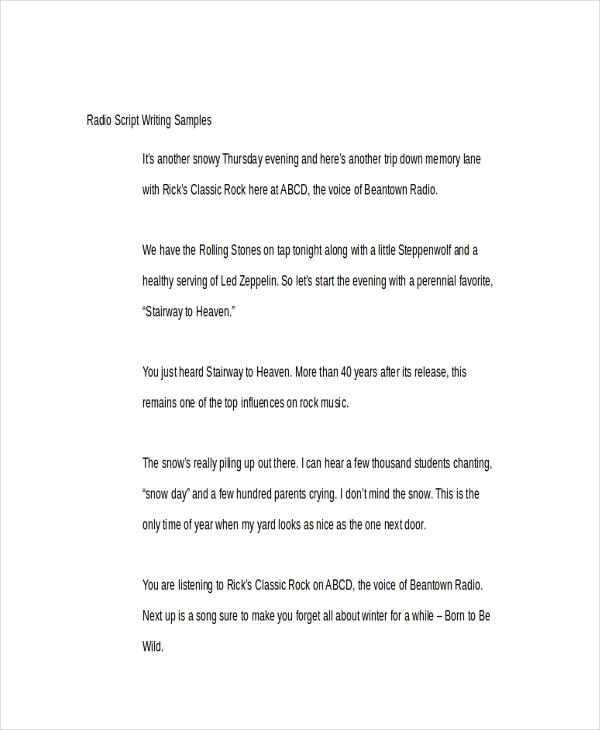 The word script in media may refer to detailed outline of a story, which includes the series of events in sequence, dialogue of the characters, stage directions (for theater play), etc. 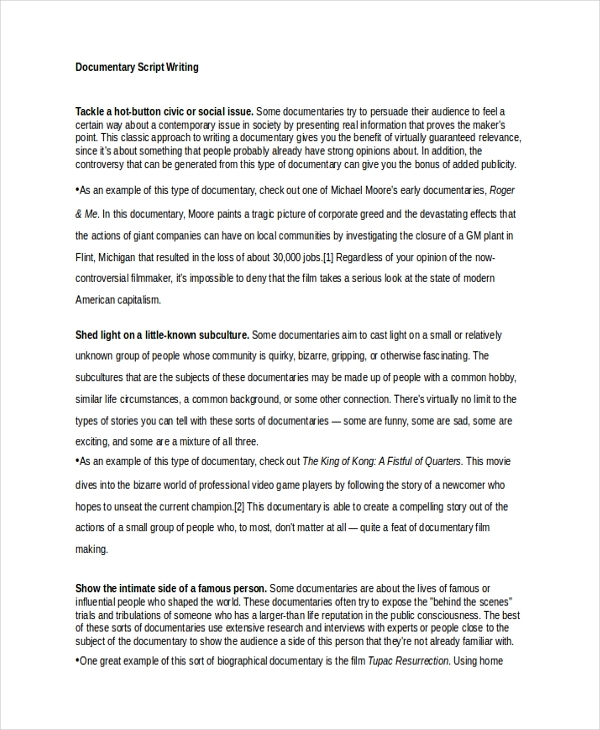 A script (also known as screenplay) creates an free outline of the whole story to be acted out by actors for a film, a stage play, a television program example, etc. Aside from the dialogue, also narrates the actions, expressions, and movements of the characters (i.e. actors). 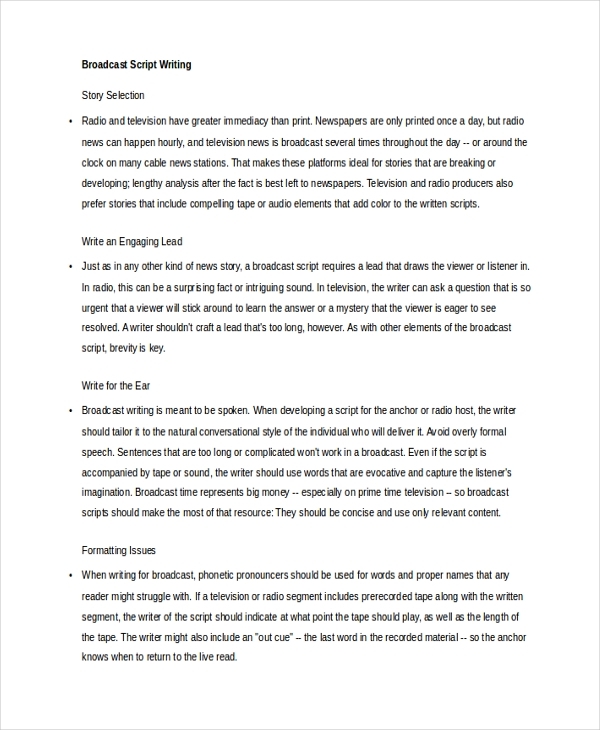 Script writing example (also referred to as screenplay writing or screenwriting) is the process of writing or constructing a script for mass media (e.g. films, theater plays, TV productions, etc). Script writers or screenwriters are the ones responsible for crafting the story which can be written with their own original idea, based on a true story, or as an adaptation of other existing written pieces. Script writers are also responsible in incorporating feelings and emotions to the characters of the story and the story itself. 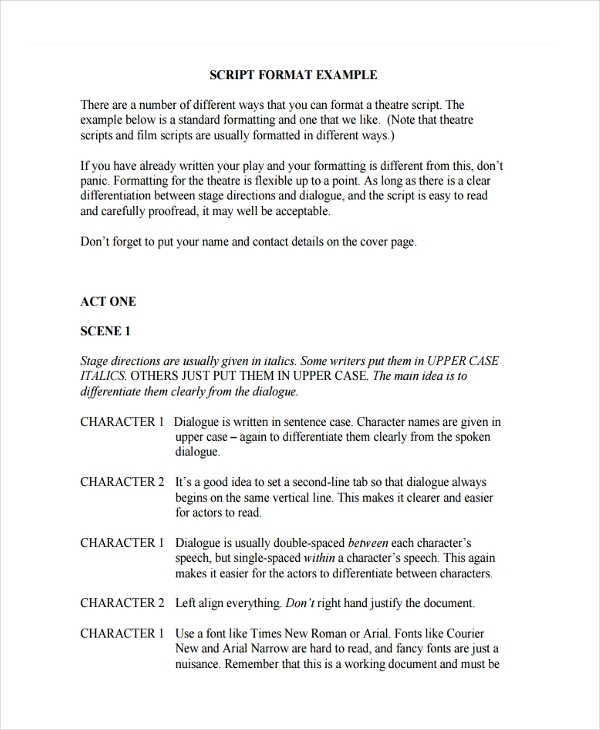 A script is a key tool used to ensure the success of the portrayal of a specific story. It also serves as a plan of the scenes to be portrayed by the actors, and script writing creates such plan. Script writing also showcases the talent of different script writers in the field of mass media. Following a script minimizes the time intended to direct the actors on how to portray a certain character. Having the scenes planned beforehand lets the actors and directors focus more on the portrayal of the story, saving time and resources in the process. Thus, script writing is considered as a fundamental process for the completion of a particular film or play. A good script describes the story in full detail, engages both the actors and directors, and captivates the audience. 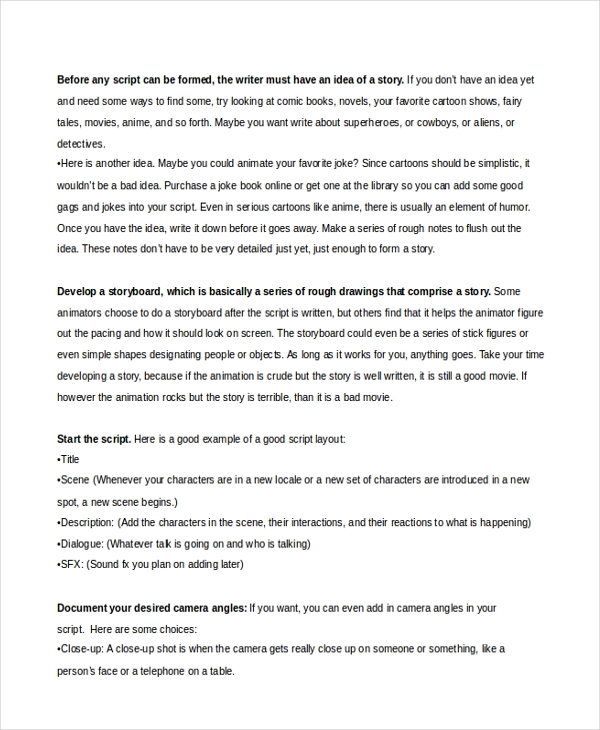 Here are several essential uses for writing a script for movies. Learn the basics. First of all, a script writer needs to understand what a script is, and how it works in order to figure out how to make one. Read other movie scripts. 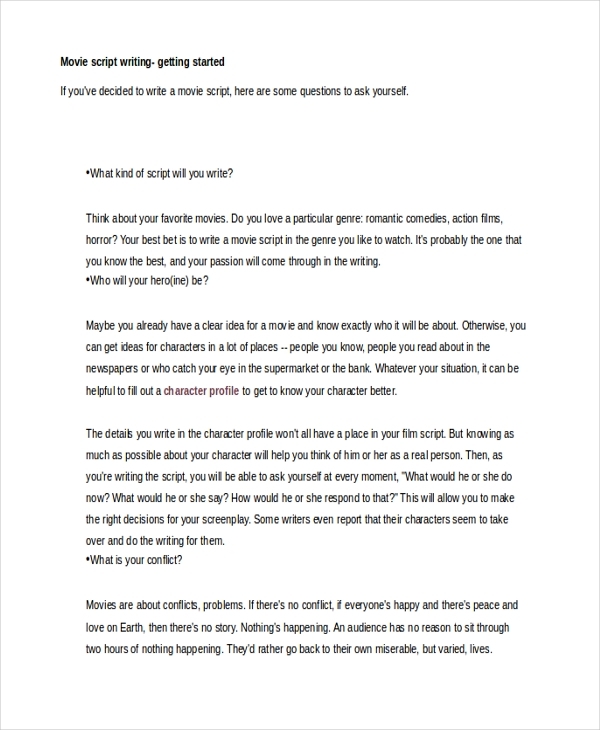 This will give you a general idea on how the dialogue is developed, how the characters are portrayed, and how the story transitions from one scene to another. Make a draft. 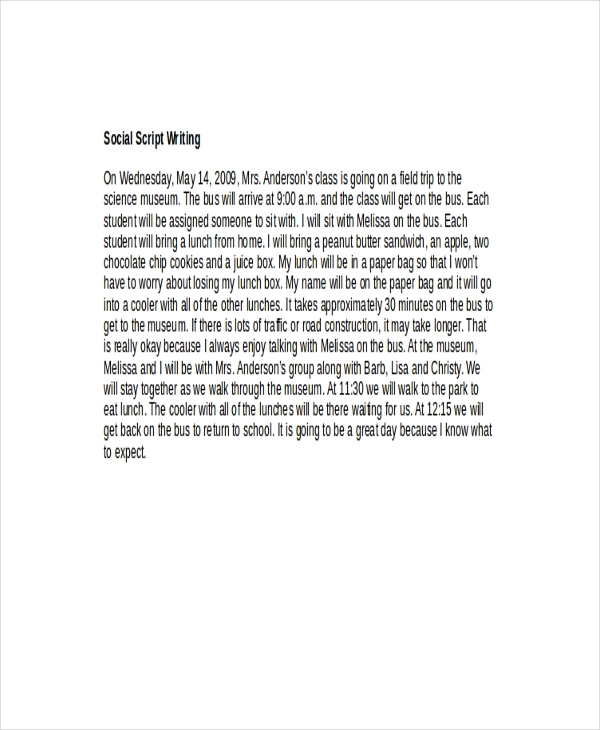 Create a draft on the sequence of events and how the story progresses from the beginning. Write all the necessary plot details and create an outline of your story. Divide your story. Act one is where you introduce the characters and their backstory. Act two is where the characters develop. Act three is where the characters experience the plot twists and conflicts, and where such conflicts are resolved. Write the scenes and dialogues. There are two of the most important elements of the script. Scenes are the events of your story. Dialogues give your characters their voice. Let a friend read your work. A friend may give you a few ideas on how to improve your story. Polish your script. This is where you omit unnecessary scenes, and add a few details to your story. Revise your story as needed.